The guns don’t load themselves do they? MiniArt’s new kit has some new ammo to load – so who better to do it but these five likely lads – Four German soldiers and their pointy and shouty supervisor busting their cohunes – just lucky you are bigger than them at 35th scale so let’s see if we can take charge of the new Miniart kit and build it up in a review for you. This is a special edition kit – a reboxing of the earlier #35029 kit which had the same figures but only half the boxes of ammo and shells to go around and inside them. Nothing else has been altered as far as I can see. The kit itself is made from injection moulded plastic and there 188 parts makes five figures and ammo boxes with shells. The usual end-opening figure cartons used by MiniArt houses a single plastic bag containing the two sprues for the figures and the four sprues of the boxes and ammunition. The box are has changed to be a more “White box” looking in keeping with a minimalist design. It looks great and the artwork is excellent. I can’t help thinking that the soldiers are in different poses to what I have seen them built up as… More on that later. The rear of the box has a painting guide in seven different paint types as well as the colours themselves which is great. The colours of the boxes and shells of five different types are also included on this part of the box. Also added is a sheet of paper which shows the construction of the ammunition boxes. The five figures of this box are of an older generation from MiniArt. Nothing has been done to these moulds as far as i can see to sharpen them up. The recent figures we have reviewed from MiniArt are pretty spiffy – some of the better we have seen in injection moulded plastic. However, it takes some work to sharpen and fit these together to make them look like the painted up versions we see at the end of this review. There is some flash and some soft detail in these figures and every one of these them could do with a sharpening up and flash removal before the painting stage. Let’s look at them each built up to show if they polish up well in the wash. 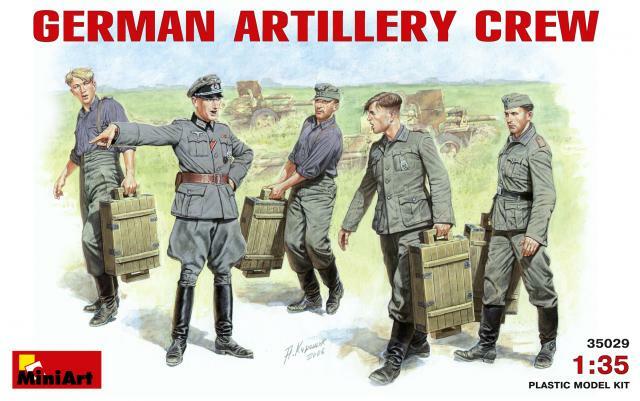 This German officer isn’t making any friends as he presses his soldiers into loading the crates of ammo. He has some nice but kinda soft detail here in this sculpt, his tunic is also a little large, His breaches hint at either a higher officer rank or an earlier war uniform. When you put him together he fits ok – but his left arm does not really fit onto his hip. You need to carve his hand to fit the recess – I have gone a bit overboard here but you can see that now the shoulder joint fits. 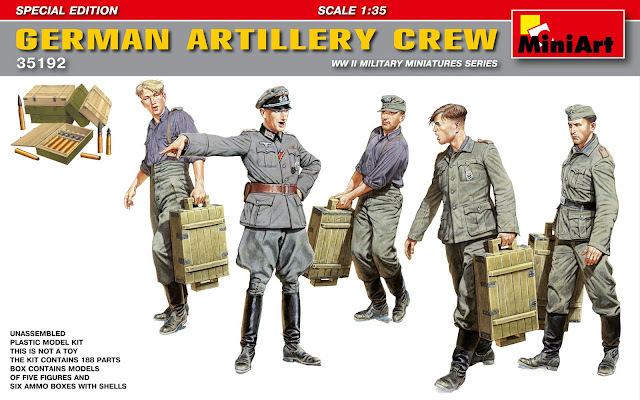 The second figure we will look at is wearing a flat M40 field cap – he is carrying one of the ammo boxes and you can see his hand has the handle moulded in his hand. This is good and solves a problem of putting the parts through the hand. This chap has a massive back! His tunic is again making him look a little large above the belt. He is not that much out of place though and he could just be a “big man.” Again detail is a little soft, but nothing you could not sharpen up with some extra scalpel work and clean up before you paint him. The third man is wearing a peaked M40 soft cap. He is seen without his heavy tunic and he is carrying his load off to the side making me think he is suffering a little bit with the weight. Nice body language. This soldier goes together without too much problems. He is however seen lifting his left leg pretty high as he walks forward so I anchored him with the help of the other figure, connected thru the box. The fourth figure is seen bare headed. He is in his work shirt without his tunic but also with braces exposed – hard at work. The sculpting on the figure is a little better or sharper than his buddies but nothing major. The last figure is seen again with the biggest tunic in the world. He is bare headed and he has the handle of the wooden box in his hand. His rear body joints were a little gappy. Nothing that cannot be fixed with some filler but that’s the problem isn’t it? On four sprues in this kit you get 8 AP shells, 8 HE shells, another 8 Frag shells and eight shells of spent cartridges (4 AP & 4 HE shells) so five different types of shells in all. There are also four ammo boxes. And these crates can be left open with rounds exposed or closed up. You can see them here from both sides as MiniArt uses slide moulds to make the complicated round ammo – spent and unspent rounds are included. The wood grain on the box is nicely done and the ribbing inside is handy and gives depth. Though the handles depicted are spurious, as from my knowledge these boxes shipped without handles to save space. The ones I have seen in pictures do not have handles, lucky for us the U shaped handles are not moulded on. Here the boxes are made up. The problems are already evident here, but knowing what must be done with these boxes I studied the pictures of the recently made up and painted figures from the MiniArt site was a good guide for me. You cannot picture them holding the boxes vertically as the box will hang lower than their legs – so I made them holding one box between two soldiers. I had to turn the “U” shaped handles AROUND to fit INTO the hands which already have the handles in them to make a proper handle like it is shown on the box. This is how I solved the issue. It’s not the way it is supposed to go but it’s how I fixed it. Two soldiers still in their tunics and two stripped down to their work shirts as they struggle with the six heavy ammo crates that they have supplied with the kit. All of these soldiers look like early or middle war soldiers due to their complete standard uniforms with high jack boots. In hindsight and fairness to MiniArt I should have swapped the figures on these two - so you have the two fellows without tunics and the two soldiers with them - but that's passed now. These next two joined together at the box which made it easier to stand them up. Of course that’s not a big problem in a dio as you will anchor them down. I kind of made these two a little bit like a two headed horse (a pushmepullyou?) and they are both looking in a similar direction. Here they are all together– ready to place in your diorama. Although i like this set I was a bit disappointed about the lack of updating of these figures or moulds. A great inclusion for the new slide moulded ammo and boxes - but the handle situation was not fixed? The fact that they do not go together like the box suggests makes a construction review very important and I am glad we decided to build them up. Otherwise how are you to know? Silver linings – Well this kit took me an evening to put together. You CAN make them into a good set that is useful for an artillery scenario and the sculpts only take a medium bit of work to get to a better standard. I hope that MiniArt continue on with the better sculpts they have been bringing out recently and ditch these old boxings, as they are not a good representation of how good they can do their newer figures. Here are the figures all made up and painted from the miniart site – they look great don’t they? This happened after a fair bit of work on the modeller's side let me tell you.